As I descended on the University of Southern California campus to interview journalist, host, and on air reporter Kay Angrum it was also the day of the Los Angeles Times Festival of Books. There was a sea of students exiting classrooms and avid readers gravitating towards booths that peaked their interest. Kay stood out, the same presence she carried on screen was true to life when I met her. Currently Kay attends the USC Annenberg School for Communication and Journalism. 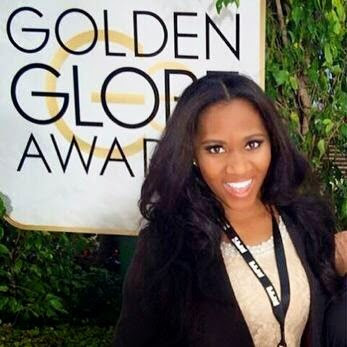 At only twenty one Kay has a polished resume working at such places as CNN, KTLA, E! News, and CNBC. This semester she’s taken the mantle of being the co-host of USC Trojan Vision’s Morning Brew. At heart Kay is a storyteller, even I found myself drawn into the tale of how she came to be a journalist. Do not confuse her natural talent to tell a compelling story with the fact that she works damn hard and has a great attitude about everything. At the time where there were great storytellers just a few feet away, I had the honor of interviewing someone who had one of the best stories on campus. With a bright future it’s safe to say Kay has already mastered the art of storytelling. When did you get the urge to be a journalist and an on air reporter? I was talking to my mom the other day about my interview for CNN. The supervisor had asked me a similar question, asking ‘Where did you get this desire for reporting or journalism?’ I had retold the story, where my mom and I were driving around and my mom and I were talking about the future. I was pretty lucky finding good schooling, with middle school and high school as well as being a good student. But I was freaking out telling my mom I don’t know what I want to do, what job am I going to have, and what’s my purpose. My mom told me to calm down and relax, that I’ll be fine, and I’ll figure it out. She was like let’s think about all the things you like to do, what you enjoy doing. She was like you love going to concerts. My mom is an amazing woman and is so supportive of my goals, my dreams, and things that I enjoy doing like going to concerts. I’m from New York so we would travel to D.C., Maryland and I think we went to De Moines to go to a Demi Lavato concert. What was great about those concerts were my mom enjoyed them as much as I did. We were going to concerts every other week and I had created this street team, which is a group that bands together to support a band or a group, with my friends. I had done that for the group B5, one of P. Diddy’s group and the street team was called the geek squad. We were always going to their concerts, and they were even familiar with us. Probably one of the highlights of my childhood was traveling to these different concerts and supporting this band, posting videos to YouTube, and having a Myspace page for them. That’s when I really started to develop those techniques and aspects of being a journalist. With going out covering these concerts, I didn’t’t know it then, but I completely know it now that’s what I was doing. At one point I even interviewed one of them. I called up their band manager and asked for an interview for the Myspace page we created. It got to a point where everyone one knew who the geek squad was with comments of fans thanking us on our YouTube videos because they could experience it although they were not there. We had quality access to content no one was getting and that was a thrill for me. I loved being that gap or bridge for fans. So my mom pointed out I love going to concerts and traveling to see these live performances. At the time I saw Giuliana Rancic do a segment on the E! Network about a special on her marriage and I loved watching her because she was so fun and energetic. She was so genuine. Going back to the conversation with my mom, she was like you love Giuliana Ranic maybe that’s what you want to do. It felt like the biggest light bulb that went on. It was such a relief knowing that I knew what I wanted to do. It wasn’t confirmed until I reached out to this woman who worked at NY1 which is a local New York news station. The newspaper at my high school, Cristo Rey New York High School in Spanish Harlem, was going to end that semester but I wanted to contribute. So I asked the teacher who was the head of the newspaper if I could have a space in one of the last issues and he said ok sure. I wanted to interview someone and started looking up local news reporters in the area. I thought it was a good opportunity to check out a news station and to get a good interview for my school newspaper. I reached out to the NY1 anchor Cheryl Wills, who is now my mentor and feels like family, contacted me back and said yes to the interview. My mom and I went down to Chelsea, where the NY1 station is located. I remember going up in the elevator with my mom, feeling nervous, anxious, and feeling confident yet still freaking out because I didn’t know what to expect. I remember the night before buying my first tape recorder and figuring out how it works on the way to the station. I interviewed her and afterwards she gave me a tour of the newsroom. At that moment I knew what I wanted to do, I knew that I wanted to be there for the rest of my life. It’s one of those moments I’ve felt several times in my journey so far where I’ll be somewhere and I know I’m supposed to be here, I know what I’m supposed to be, and this is for me. I remember Cheryl Wills letting me read through some scripts, sit in the anchor chair, and put the lights on and doing the most for me. I was thinking here I am this little high school girl and she’s an anchor letting me do this. The entire time I was so humbled. She just had this presence about her that was otherworldly and she still does. There is just something about her in person that I look up to and in that moment I knew I want to be like Cheryl. I knew I wanted to be in the studio and any newsroom I go to I always have that feeling of this is where I’m supposed to be. As a host and an on air reporter you have a real presence about you. Where do you think that comes from? I don’t know, my mom has always said that. My mom is the cheerleaders of all cheerleaders. Sometimes you need that person outside of yourself to support you and root you on. I think that presence about me comes from a place of me wanting everyone to feel happy, welcomed, and comfortable. Currently you are attending the USC School of Journalism and you’ve worked at such at outlets as CNN, E! News, and CNBC. What lessons have you learned in your experiences at all of these places that have helped you grow as a journalist and on air reporter? I would probably say being mindful of the way I carry myself and never saying no to an opportunity. I say being mindful of the way you carry yourself, with the respect that this is such a small business. What I found out is that how I do at an internship as far as my performance goes, the relationships I build, the kind of work I’m able to produce, and the impression that I left with them has always been something I want people to remember me by. Like ‘Oh she was so helpful’ or ‘Oh she came up with these great ideas’ or ‘Oh she was pleasant to be around’. It’s about those things that they always tell us or teach us in school. I always wanted to make sure with every project that I do, that I’m doing it to my best ability and making sure it has me written all over it. So when it comes to interning whether it was at KTLA, CNBC, E! News or CNN I have to remind myself that every day is like the first interview. Sometimes you get so relaxed and think you’ve done one internship, you’ve done them all, not true. People remember you by the work that you do and the very last thing that you’ve done for them. That’s why I think that impression, the idea of leaving a good one, has definitely helped with reporting and interviewing because will the person you are interviewing remember you really listening to them and asking questions. Saying wow she really just heard what I said or are they going to be like she kind of wasn’t interested. I want to make sure that who I am as a person comes through in everything that I do because it’s my brand. One of your mantras is “Dare to Dream”. What are some inspirations in your life that foster those big dreams? Definitely my mom, she inspires me to no end. I wish everyone can meet my mom and I feel like everyone says that, but my mom is such an amazing cheerleader and inspires me every day. Honestly I think she believes in me more than believe in myself. Like the other day I was editing this footage and I added something my supervisor told me not to add and little things like that would trip me up. I was like no, I’m not perfect but my mom reminded me, you’re not going to be perfect and you’re going to make mistakes. My mom is literally a walking reminder to me that things get better and everything in our life happens for a reason. Every step of the way is a step towards growth that will make you stronger and better. She’s always telling me to follow my dreams. Who else inspires me is my mentor Cheryl. Some people get caught up with the whole Hollywood thing or the next move and Cheryl is a reminder for me to take a step back and appreciate everything. Cheryl is very involved in the black communities in New York. She has this book she published about her ancestors, about them being slaves, and I think she’s coming out with another book. It’s one of those things when you think of Cheryl it’s like wow; she is so selfless and always trying to build up other people. She’s constantly supporting me and giving opportunities for others. The guy who is doing the cover art for her book that’s coming out soon messaged me and asked how I knew Cheryl. He told me the story of how he had met her one time and he wanted to draw for her first book and she reached out to him years later asking him to do the cover art for her book. It’s moments like that that keep me grounded and remind me of the person that I want to be. It’s very important every step of the way that you don’t get caught up in the glitz or the glam. Tell us more about you being the host of USC Trojan Vision’s Morning Brew? I’ve been working with Trojan Vision since my freshman year of college here at USC. My first semester I auditioned for host auditions and I was an on camera correspondent, then I went on to being an in studio host and then becoming an in studio host for their morning talk show. Then I went on to be the host on their late night talk show and last semester I took a break from Trojan Vision. This semester I’m doing Morning Brew. It’s a morning talk show that has it’s variety with an interesting news piece and sometimes an in studio guest that will do either a musical performance or a celebrity or someone interesting on campus. Recently we spoke with a freshman student from the Jimmy Iovine and Andrew Young School who created her own shoe. So we make pieces like that. Last year you received the John Noel Scholarship for Excellence in Broadcast Award from the National Association of Black Journalists. What was that experience like? That was amazing! That was very humbling. I was first told that I had received it from Cheryl Wills. I think she messaged my mom on Facebook. She said ‘Hey we’re giving Khadija, this award and we know that she’s in school right now and if you want to stop by and accept this award for her’ but my mom being the mom that she is said we’re flying you out there. I was like ok, this was awesome and the way Cheryl presented it was that it was the first time they were giving this award out. I learned more about who John Noel was; he had passed away recently in that past year and was very close with everyone in the National Association of Black Journalists. He has this beautiful family with these amazing girls. When my mom told me about the award I didn’t think it was just for me, I thought it was for a group of students. To be completely honest I hadn’t really been as prepared as I wanted to be. My mom told me I should probably think of something to say and said I should write something. There was this whole thing of not understanding just how serious and amazing of an opportunity it was until I was in that moment. They were introducing the award while showing this video of all the amazing work that John Noel had one and how the people who he had worked with remembered him. Going up there I was still confused as to why I was getting this award and I said thank you. Even then I told my mom I wish could have said more but I was so baffled and in shock that it was awarded to me. I remember thinking afterwards it was a weight that was put on my shoulder that not even in the slightest bit do I take for granted. It’s definitely a wonderful reminder that I have been given this honor that reminds me as I go through my journey to be the best journalist that I can be and to keep his legacy going. What have you been your favorite events that you’ve covered and which ones do you look forward to covering in the near future? My favorite event that I’ve covered was the Sundance Film Festival. That was so much fun and it was my favorite because they gave so much responsibility that I hadn’t expected. I’m close with one of the people at the Associated Press and she was the one who asked me to go because they were looking at college students to help out. She was like we know you, we know your work, and if you’re available to go we would love to have you. Everyone there was so nice and worked with five people- Two camera guys, two producers, and the driver. We got really close and everyone was so welcoming. Sometimes I feel intimidated being a college student or being twenty one, at the time being twenty, but sometimes that’s great because people feel inclined to show you more. Then from there give you more responsibility and teach you things. I was getting tips from the camera guy on where to hold the mic and I learned so much. There were a lot of events going on at once so I was sent to cover things by myself. Here I am thinking I’ll be behind the scenes or transcribe when they get back but I was being sent out to the tent to interview actor Jason Segal and interview so many people I didn’t think I’d get to do. It was cool and great. I felt that inspiration and that confirmation where it was one of those moments I knew this was what I was supposed to do. One event that I would definitely love to do is the Cannes Film Festival because I really liked Sundance. It was something that I would not of thought to do on my own if it wasn’t offered to me because film isn’t something I’m very interested in. Sundance definitely opened me up and I loved film festivals. What is the most rewarding part of being a journalist and on air reporter? The most rewarding part of being a journalist is seeing your stories come to fruition, being there from beginning to end. Maybe that speaks to being a producer as well because sometimes you have reporters that are given a script or sent to do a live shot. Some might not be there for all of the work that went into it before and maybe they don’t see how it looks afterwards but my schooling here at USC and work at Sundance allows me to know what it feels like to be there throughout the whole process. Seeing that process, seeing how it works at the end of the day, and seeing what your story looks like is very rewarding. I love talking to people and I love hearing people’s story. An example of that was being on the train the other day and there was this lady in the seat next to me and we spoke for a good twenty to thirty minutes. She was telling me what she does and she was helping this man find a home. She had known him for some time and he was a victim of abuse at home with his girlfriend abusing him and I feel like there is something so relaxing for someone to tell you their story. Whether I was able to do anything with that or not, but I feel like the power of communication is so real. To be able to open up to someone, talk to someone, or tell someone what you’re doing is just amazing. I love that I’m able to be a part of that, to be able to help that, and help provoke conversation if even. I think it was coming to Los Angeles by myself was pretty bold. It was a big deal to make that transition from New York to LA at nineteen especially since I had lived in New York for a majority of my life. At one point I started to feel the jitters. It started to sink in that my mom would be on another coast, but my mom said that I got this and encouraged me to do it. I think I’ve been doing pretty well since. Career wise, I obviously want to graduate from USC and definitely want to be a reporter so that’s what I’m looking to do. I’m trying to get down on the different markets and starting to hone in on where it is I see myself. I want to be in a local market, hopefully on the east coast somewhere close to home. Long term I would love to do a morning show like Good Morning America, Today Show, or even a local morning show would be amazing life for me because I think I’ve grown as a reporter to know that entertainment is not all that I want to do. I love the stories about the everyday person doing extraordinary things, those good feel stories, and good Samaritan stories. Career wise that is what I want to do and spiritually I want to be happy. I know that sounds super generic and super corny, but it’s true. Where ever I go I don’t want there to be a cloud over me where I have to do this or do that. I feel like people are so hung up on their next move that they don’t take the time to hold on to the moments and appreciate them. It’s ok to look back and be nostalgic as long as it’s productive. To look back and say I’ve done this much and now going forward I want to enjoy every moment of this journey. All the scary moments, the uncertainty, all the mess ups, and mistakes. One of my recent pep talks with my mom was her telling me you would rather want to make a mistake than not make a mistake at all and not know how to grow from that. The lesson really is in making that mistake, learning how I get up, dusting my shoulder off and moving on. I always think how to do I take this situation that I’m in and grow from it, be a better person, be a stronger woman, a better reporter, and a better journalist. It’s all about your outlook on it and that’s kind of how I hope to see myself. I don’t want to get clouded by this industry, I want to grow from it and be a better person for myself and others.